Dual On/Off Real Setting Timer	Auto Restart : Random: 32 SUPC: SDL531178755 SpecificationsWARRANTYWarranty	1 Year and 4 Years Manufacturer Warranty on CompressorIndoor DimensionsWidth	1070 mmDepth	235 mmNet Weight	12 KgHeight	290 mmPerformance FeaturesOutdoor Sound Level	57 dB(A)Moisture Removal	3.7 Liter/HourIndoor Sound Level	H/L/Q-LO: 49/42 dB(A)Air Circulation	Indoor/HI: 18.2 m cube/minModesDry	-Other Modes	Soft Dry Operation Mode, Powerful Mode, Automatic Operation Mode (Cooling), Sleep ModeCool	-PowerEnergy Save	-Energy Efficiency Ratio	EER: 11.38 Btu/hW, COP: 3.33 W/WCooling Operating Current	8.7 AmpsPower Consumption	Power Input: 1950 WattsPower Requirements	230 VEnergy Rating	4 StarGeneralFunctions	Odour Removing FunctionRefrigerant Type	-Capacity	2 TonCompressor	-Type	Split Air ConditionerAir Flow Direction	Control: Up and Down with Manual Horizontal Airflow Direction ControlFiltersActive Carbon	-Anti-Bacteria	-Catechin	-Other Filters	PM2.5 FilterOutdoor DimensionsWidth	885 mmDepth	377 mmNet Weight	43 KgHeight 571 mmAdditional FeaturesOther Features	Refrigerant Pipe Diameter - Liquid Side: 6.35 mm; Gas Side: 15.88 mm; Pipe Extension - Chargeless Pipe Length: 7.5 m; Maximum Pipe Length: 15 m; Maximum Elevation Length: 5 m; Additional Refrigerant Gas: 30 g/m; Removable and Washable Panel; Micro Channel Condenser; Blue Fin CondenserConvenience FeaturesAuto Restart	Random: 32Other Convenience Features 24-Hour Dual On/Off Real Setting Timer; Temperature Indicator; Top Panel Maintenance AccessFront Panel Display	-Self Diagnosis	-Technical SpecificationIn the Box	Main Unit, LCD Wireless Remote ControlExperience, the next generation in cooling with the Panasonic 2.0 ton split air conditioner. The PM2.5 filter ensures that even the tiniest dust particle is filtered out, letting in only the most pure and fresh air. 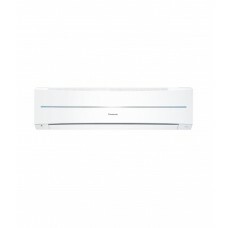 Panasonic makes use of the Blue Fin Condenser to ward of the damage caused due to salty air, wind, dust and other corrosive factors. 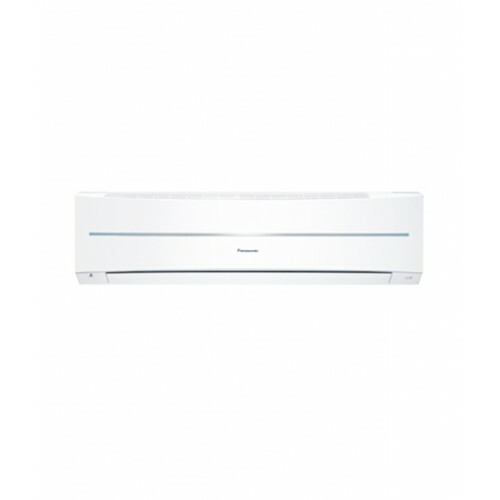 The 4 star rated split air conditioner comes with a powerful mode which cools the room quickly with full power and strong airflow.